For the similarly titled Nag Hammadi text, see Gnostic Apocalypse of Peter. The Apocalypse of Peter (or Revelation of Peter) is an early Christian text of the 2nd century and an example of apocalyptic literature with Hellenistic overtones. It is not in the Bible, but is mentioned in the Muratorian fragment, the oldest surviving list of New Testament books, which also states it was not allowed to be read in church by others. The text is extant in two incomplete versions of a lost Greek original, one Koine Greek, and an Ethiopic version, which diverge considerably. As compiled by William MacComber and others, the number of Ethiopic manuscripts of this same work continue to grow. The Ethiopic work is of colossal size and post-conciliar provenance, and therefore in any of its variations it has minimal intertextuality with the Apocalypse of Peter which is known in Greek texts. The Greek manuscript was unknown until it was discovered during excavations initiated by Gaston Maspéro during the 1886–87 season in a desert necropolis at Akhmim in Upper Egypt. The fragment consisted of parchment leaves of the Greek version that was claimed to be deposited in the grave of a Christian monk of the 8th or 9th century. The manuscript is in the Coptic Museum in Old Cairo. The Ethiopic version was discovered in 1910. Before that, the work had been known only through copious quotations in early Christian writings. In addition, some common lost source had been necessary to account for closely parallel passages in such apocalyptic Christian literature as the Apocalypse of Esdras, the Apocalypse of Paul, and the Passion of Saint Perpetua. The terminus post quem—the point after which we know the Apocalypse of Peter must have been written—is revealed by its use (in Chapter 3) of 4 Esdras, which was written about 100 AD. The intellectually simple Apocalypse of Peter, with its Hellenistic Greek overtones, belongs to the same genre as the Clementine literature that was popular in Alexandria. Like the Clementine literature, the Apocalypse of Peter was written for a popular audience and had a wide readership. The Muratorian fragment, the earliest existing list of canonical sacred writings of the New Testament, which is assigned on internal evidence to the last quarter of the 2nd century (c. 175–200), gives a list of works read in the Christian churches that is similar to the modern accepted canon; however, it also includes the Apocalypse of Peter. The Muratorian fragment states: "the Apocalypses also of John and Peter only do we receive, which some among us would not have read in church." (It is interesting that the existence of other Apocalypses is implied, for several early apocryphal ones are known: see Apocalyptic literature.) The scholar Oscar Skarsaune makes a case for dating the composition to the Bar Kochba revolt (132–136). The Apocalypse of Peter is framed as a discourse of the Risen Christ to his faithful, offering a vision first of heaven, and then of hell, granted to Peter. In the form of a nekyia it goes into elaborate detail about the punishment in hell for each type of crime, later to be depicted by Hieronymus Bosch and the pleasures given in heaven for each virtue. 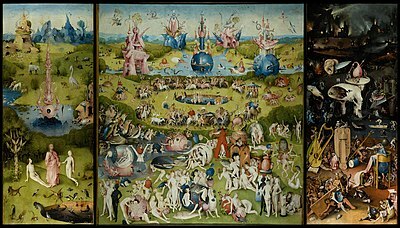 The right-most panel in Bosch's The Garden of Earthly Delights illustrates the journey in the abode of the dead. Blasphemers are hanged by the tongue. Women who "adorn" themselves for the purpose of adultery, are hung by the hair over a bubbling mire. The men who had adulterous relationships with them are hung by their feet, with their heads in the mire, next to them. Murderers and those who give consent to murder are set in a pit of creeping things that torment them. Men who take on the role of women in a sexual way, and lesbians, are "driven" up a great cliff by punishing angels, and are "cast off" to the bottom. Then they are forced up it, over and over again, ceaselessly, to their doom. Those who lend money and demand "usury upon usury" stand up to their knees in a lake of foul matter and blood. "The Revelation of Peter shows remarkable kinship in ideas with the Second Epistle of Peter. It also presents notable parallels to the Sibylline Oracles while its influence has been conjectured, almost with certainty, in the Acts of Perpetua and the visions narrated in the Acts of Thomas and the History of Barlaam and Josaphat. It certainly was one of the sources from which the writer of the Vision of Paul drew. And directly or indirectly it may be regarded as the parent of all the mediaeval visions of the other world." The Gospel parables of the budding fig tree and the barren fig tree, partly selected from the parousia of Matthew 24, appear only in the Ethiopic version (ch. 2). The two parables are joined, and the setting "in the summer" has been transferred to "the end of the world", in a detailed allegory in which the tree becomes Israel and the flourishing shoots become Jews who have adopted Jesus as Messiah and achieve martyrdom. "My Father will give unto them all the life, the glory, and the kingdom that passeth not away, ... It is because of them that have believed in me that I am come. It is also because of them that have believed in me, that, at their word, I shall have pity on men... "
[and God said]"... thou must not tell that which thou hearest unto the sinners lest they transgress the more, and sin". Clement of Alexandria appears to have considered the Apocalypse of Peter to be holy scripture. Eusebius, Historia Ecclesiae (VI.14.1) describes a lost work of Clement's, the Hypotyposes (Outlines), that gave "abridged accounts of all the canonical Scriptures, not even omitting those that are disputed, I mean the book of Jude and the other general epistles. Also the Epistle of Barnabas and that called the Revelation of Peter." So the work must have existed in the first half of the 2nd century. Although the numerous references to it attest that it was once in wide circulation, the Apocalypse of Peter was ultimately not accepted into the Christian canon. There are more than 100 manuscripts of an Arabic Christian work entitled the Ru'ya Butrus, which is Arabic for the 'Vision' or 'Apocalypse' of Peter. Additionally, as catalogues of Ethiopic manuscripts continue to be compiled by William MacComber and others, the number of Ethiopic manuscripts of this same work continue to grow. It is critical to note that this work is of colossal size and post-conciliar provenance, and therefore in any of its recensions it has minimal intertextuality with the Apocalypse of Peter, which is known in Greek texts. Further complicating matters, many of the manuscripts for either work are styled as a "Testament of Our Lord" or "Testament of Our Savior". Further, the southern-tradition, or Ethiopic, manuscripts style themselves "Books of the Rolls", in eight supposed manuscript-rolls. In the first half of the 20th century, Sylvain Grebaut published a French translation, without Ethiopic text, of this monumental work. A little later, Alfons Mingana published a photomechanical version and English translation of one of the monumental manuscripts in the series Woodbrooke Studies. At the time, he lamented that he was unable to collate his manuscript with the translation published by Grebaut. That collation, together with collation to some manuscripts of the same name from the Vatican Library, later surfaced in a paper delivered at a conference in the 1990s of the Association pour l'Etudes des Apocryphes Chretiennes. There seem to be two different "mega-recensions", and the most likely explanation is that one recension is associated with the Syriac-speaking traditions, and that the other is associated with the Coptic and Ethiopic/Ge'ez traditions. The "northern" or Syriac-speaking communities frequently produced the manuscripts entirely or partly in karshuni, which is Arabic written in a modified Syriac script. Each "mega-recension" contains a major post-conciliar apocalypse that refers to the later Roman and Byzantine emperors, and each contains a major apocalypse that refers to the Arab caliphs. Of even further interest is that some manuscripts, such as the Vatican Arabo manuscript used in the aforementioned collation, contains no less than three presentations of the same minor apocalypse, about the size of the existing Apocalypse of John, having a great deal of thematic overlap, yet quite distinct textually. Textual overlaps exist between the material common to certain Messianic-apocalyptic material in the Mingana and Grebaut manuscripts, and material published by Ismail Poonawalla. The manuscripts having the "Book of the Rolls" structure generally contain a recension of the well-known "Treasure Grotto" text. The plenary manuscripts also generally contain an "Acts of Clement" work that roughly corresponds to the narrative or "epitome" story of Clement of Rome, known to specialists in pseudo-Clementine literature. Finally, some of the plenary manuscripts also contain "apostolic church order" literature; a collation of that has also been presented at a conference of the Association pour l'Etudes des Apocryphes Chretiennes. Collations of these manuscripts can be daunting, because a plenary manuscript in Arabic or Ethiopic/ Ge'ez is typically about 400 pages long, and in a translation into any modern European language, such a manuscript will come to about 800 pages. Overall, it may be said of either recension that the text has grown over time, and tended to accrete smaller works. There is every possibility that the older portions that are in common to all of the major manuscripts will turn out to have recensions in other languages, such as Syriac, Coptic, Church Armenian, or Old Church Slavonic. Work on this unusual body of medieval near eastern Christianity is still very much in its infancy. ^ The Greek Akhmim text was printed by A. Lods, "L'evangile et l'apocalypse de Pierre", Mémoires publiés par les membres de la mission archéologique au Caire, 9, M.U. Bouriant, ed. (1892:2142-46); the Greek fragments were published by M.R. James, "A new text of the Apocalypse of Peter II", JTS 12 (1910/11:367-68). ^ The Ethiopic text, with a French translation, was published by S. Grébaut, Littérature éthiopienne pseudo-Clémentine", Revue de l'Orient Chrétien, new series, 15 (1910), 198–214, 307–23. ^ Jan N. Bremmer; István Czachesz (2003). The Apocalypse of Peter. Peeters Publishers. pp. 17–. ISBN 978-90-429-1375-2. ^ For the date of the Ethiopic version, see C. Mauer in E. Henecke, E. Schneemelcher and R. Wilson, New Testament Apocrypha (Philadelphia/Westminster) 1964. ^ Oscar Skarsaune (2012). Jewish Believers in Jesus. Hendrickson Publishers. pp. 386–388. ISBN 978-1-56563-763-4. Skarsaune argues for a composition by a Jewish-Christian author in Israel during the Bar Kochba revolt. The text speaks of a single false messiah who has not yet been exposed as false. The reference to the false messiah as a "liar" may be a Hebrew pun turning Bar Kochba's original name, Bar Kosiba, into Bar Koziba, "son of the lie". ^ The Apocalypse of Peter was presented as a nekyia, or journey through the abode of the dead, by A. Dieterich, Nekyia (1893, reprinted Stuttgart, 1969); Dieterich, who had only the Akhmim Greek text, postulated a general Orphic cultural context in the attention focused on the house of the dead. ^ Pointed out in detail by David Fiensy, "Lex Talionis in the 'Apocalypse of Peter'", The Harvard Theological Review 76.2 (April 1983:255–258), who remarks "It is possible that where there is no logical correspondence, the punishment has come from the Orphic tradition and has simply been clumsily attached to a vice by a Jewish redactor." (p. 257). ^ Specifically Sibylline Oracles ii., 225ff. ^ The canonic New Testament context of this image is discussed under Figs in the Bible; Richard Bauckham, "The Two Fig Tree Parables in the Apocalypse of Peter", Journal of Biblical Literature 104.2 (June 1985:269–287), shows correspondences with wording of the Matthean text that does not appear in the parallel passages in the synoptic gospels of Mark and Luke. ^ These may be found in Georg Grag, Die Arabische Christliche Schriftsteller, in the Vatican series Studi e Testi. Eileen Gardiner, Visions of Heaven and Hell Before Dante (New York: Italica Press, 1989), pp. 1–12, provides an English translation of the Ethiopic text. The Apocalypse of Peter Online translation of the work. Bibliography on the Apocalypse of Peter.